Periodontal disease is one of the scariest oral health conditions that you can face because it is irreversible. This advanced form of gum disease is a condition that you will have to manage for the rest of your life once it develops. What makes periodontal disease so destructive is that it damages something your body can’t naturally grow back: your jawbone. Your teeth are connected by tissue to your jaw. It’s what makes them strong enough to chew food. When bacteria spread deep beneath your gum line, they sever this connection, causing your teeth to become loose. Your body can produce more of this connective tissue between tooth and bone if it needs to. That’s why it’s so important to treat gum disease as early as possible. You can recover from some cases of infection and enjoy a clean bill of oral health. However, once you develop periodontitis, the infection is eating away at your jawbone mass. That means that there is added space between your tooth and jaw, which can eventually cause your tooth to fall out. Your bone won’t grow back over time, and you’ll need to see a periodontal specialist. How can you treat your gum disease condition? Scaling and root planing is commonly referred to as “deep cleaning” because it involves cleaning beneath the gum line. 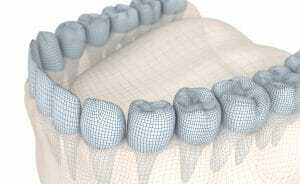 Your dentist can perform “scaling,” which removes the bacteria deep beneath the gums. Then, your dentist will perform “root planing,” which smooths the roots of your tooth so that the connective tissue have an ideal surface to connect with. This can rid your mouth of gum disease and allow your teeth to return to their healthy state. If you have periodontitis, this type of regular cleaning is necessary to keep your jaw bacteria-free. The type of regular treatment needed to manage gum disease likely has you wanting to avoid the condition altogether. The best way to do this is with preventive care. Brushing your teeth (especially around the gum line) at least twice a day is a good start, but flossing is also crucial. You need to prevent bacteria from aggregating around your gums. You’ll also want to make regular visits to your dentist’s office so that should a problem arise, he or she can spot it and begin treatment right away. Genetics play a major role in your oral health. Some individuals are predisposed to gum disease, and knowing this about yourself gives you a better chance to manage the condition. Greenhaven Family Dental provides scaling and root planing treatment to clear up gum disease and manage periodontitis. Schedule an appointment at Greenhaven Family Dental in Baxter, MN by calling 218-454-0523.